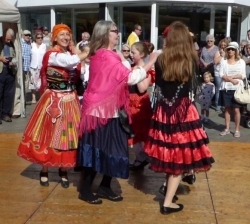 The Bognor Regis International Dance Ensemble is a non-profit group whose aim is to increase local opportunities for international folk dancing. It is an associated group of the Society for International Folk Dancing (SIFD). The regular weekly class is an opportunity for anyone to learn and enjoy folk dances from around the world. Dancing Vira das Cavacas (left) at the 2017 Southdowns Folk Festival; and Erva Cidera (right). Our costumes were Portuguese, Spanish and Italian. 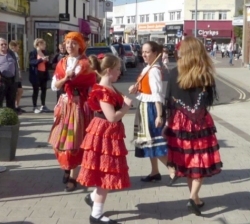 We danced this Dutch dance in breezy Bognor in multi national costumes: Dutch, Romanian, Austrian, Polish, Greek, Macedonian, Serbian and Italian. Janet's current ambition is to convey the movements and feelings of Semah dance; this may not be easy - so until BRIDE have mastered the steps and achieved some of the nuances here is a video of the real thing. 2014 was the second Southdowns Folk Festival, we took part alongside a plethera of Morris, Clog and Folk groups, in different venues around Bognor Regis. 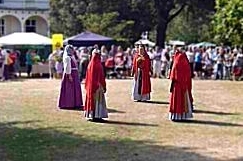 We concentrated on Greek dances (costumes from Rhodes) for an appearance at the 2013 Bognor Birdman Rally. 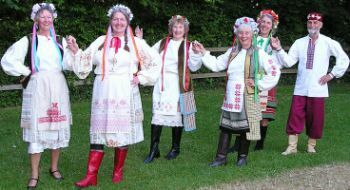 In 2012, we enjoyed dancing at a Diamond Jubilee fete in Funtington, four dancers in Polish costume. Other members of the group were in English, Ukrainian or other European costumes. We had an outing with musicians, Steve, Hilary and Frank, to the 17th Century Village in Gosport. A day of singing and dancing English dances. 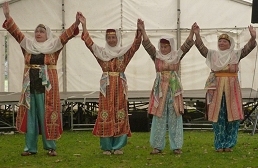 The Armenian dance, Dagh Gorani, is a great favourite with the group because of the beautiful music. 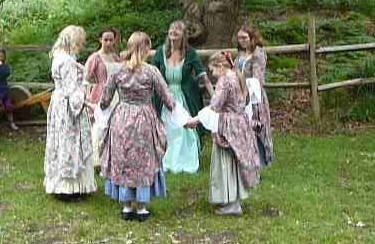 Some of us performed it at the Hotham Park Heritage Fair, an annual regular event. Both classes performed at the Royal Albert Hall in 2010, where, along with other members from around the country, we represented the Society for International Folk Dancing. We travelled to London to the Embankment Gardens Theatre several times as part of the SIFD summer events, and, to indulge ourselves in a little sightseeing. The group is run by Janet Douglas who is an approved teacher of the Society for International Folk Dancing (SIFD). More importantly she understands that dance lessons for children are as much about fun as education. The children learn more if they are enjoying themselves. The age range is from 5 years upwards. Every year we prepare a display team to perform international folk dancing at local fetes and carnivals. Every year we try to attend at least one special event. In past years we have performed at the Royal Embankment Gardens, the Hawth Theatre, Crawley and the Royal Albert Hall. In 2009 the children competed (with music supplied by some of the adults) at the Llangollen International Musical Eisteddfod. 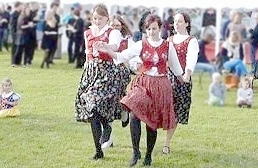 The display team of all ages enjoy international folk dancing, dressing up and performing in public. The grown-ups in the display team have irregular practice meetings depending on the display schedule. They also meet to co-operate in various ventures for fun.